Masonry as we know it dates from 1717, but Masonic legends claim a much greater antiquity for the Craft. Many naive and credulous members take those fanciful pretensions seriously and believe that Masonry can be traced back to King Solomon's Temple or to the Tower of Babel. One discredited Masonic historian, Dr. George Oliver, maintained that the lodge began with creation itself and that Adam was not only the first man but the first Masonic Grand Master. According to Oliver, this pure Masonry became corrupted at the time of the Tower of Babel but was rediscovered and purified by Saint John the Evangelist. Masons are led to believe by their ritual and various commentaries that King Solomon, Hiram of Tyre, Hiram Abiff (Huram abi), and Saint John the Evangelist were all active members of the lodge. Intelligent Masons, of course, know this for the spoof that it is, but many others never question the claim to antiquity. Their brethren, realizing the value of antiquity to esprit de corps, do not bother to disenchant them. Modern Masonry has borrowed from many diverse traditions, such as those of the suppressed Knights Templar, the Roman Collegia of Artificers, the Jewish Kabbalists, the mystery cults, the Rosicrucians, and the operative masons of the Middle Ages. I own this book. It is great. 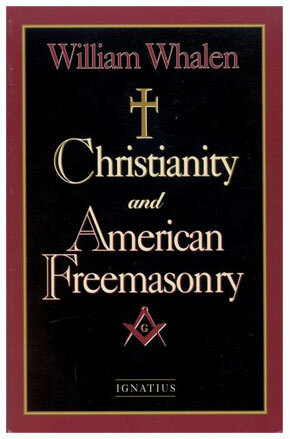 It explains why being a Mason is incompatible with Christianity, even protestantism. It helped me realize that I needed to renounce my fraternity membership which also required an oath on a Bible, just to join a stupid college club. Just as well. The masons wouldn't let me in. Until I renounced my Masonic orders last year, I was one of the best known Masons in my city. Past Master twice over, Past High Priest of Royal arch Masons, 32 KCCH of the Scottish Rite, Knight Mason, Royal Order of Scotland, etc., etc. It was a big part of my life for many years. But as I came to recover my Catholic faith, my conscience began to bother me. It wasn't so much that there was anything explicitly anti-Catholic in the Lodge; indeed, the authorities had actually redacted much of that stuff out of the rituals some time ago. No, it was two things. First, the indifference to religion that Masonry inculcates. The notion that all particular religions are inferior to the true, natural religion best preserved in Masonry. Second, the mockery of Our Lord's Resurrection which seems to be preserved in the rituals. I say "seems," because the mockery is subtle -- but I became convinced that it is real. Ultimately I then had to face a real problem: if the CHurch is in fact what she claims to be, and if Christ is Who we claim Him to be, how could I belong to an organization that mouths pieties about God while simultaneously forbidding its members to proclaim the particular truth? I cut this Gordian knot by publicly renouncing my orders. It cost me friendships that meant much to me, but my conscience is finally clear. American Masons spend no time at all thinking about such things. To them, Masonry is a civic and social club, period. Europe is another matter. I have attended Lodges there, and the seething hatred of the Church is frightening. I could write a lot more about this, but sleep beckons. Say a prayer for the Masons, I will. Incidentally, no Mason seriously believes any of the fanciful claims of antiquity. That's just fun stuff. Speculative Masonry goes back to the fifteenth century, that's it. There is some ambiguous documentary evidence for the tenth century, but it's very much debatable. The four Lodges that met in 1717 to form the first Grand Lodge were working Lodges that were already in existence, so Masonry is older than 1717. The oldest records of a working Lodge date, IIRC, to 1483. The first of the secret lodges took place in June AD 43 when this secret society was first founded. From day one the most secretive events were to be the names of the founders and the date it was founded. It was delibertly hidden in the occult to cause everyone except the original 9 founders to get lost in the chase. An heir of one of the original founders submitted the name Freemasonry in 1717 as a new name to replace the old fearful name. Shortly thereafter this heir was murdered and his copy of the old records were stolen and seemingly dissapeared. A Dr. James Anderson was among the new group that changed the name. The Hiram Abiud, surnamed Abiff, was an original founder and received the title Master, claiming he deserved it more than Jesus. Hiram died mysteriously, it was feared wolves killed him. His nephew Tublecain Abiuud found him and designed the wake for the 3rd degree as Hiram's degree. Every candidate had to agree to act the part of the dead Hiram and allow the dead Hiram to supposedly come alive as the new master mason. As an inheritance to the decendants of the 9 founders, a copy of the secret meetings were to be written and kept till the end of time. In 1717, 7 copies were regarded as lost. Somewhere there is one or maybe two copies of the original dated AD 43. Copies of the original Hiram's first copy may well still exist somewhere. This was the last to be quoted from. Supprising to all, the Light refered to as the light being searched for is the Jewish Religion, the reviving of such, it and the Jewish nation. It stated Jesus was its greatest enemy and that this association was to last till every follower of Jesus was removed from the earth. Go figure.